With a hint of volatility returning to the stock market this week, we though it good timing to review some of the market-based indicators we follow that help us judge the sturdiness of the market. This is by no means an exhaustive list, but rather a few items to consider when evaluating whether pullbacks are for buying or selling. In each of the charts below, the indicator in question is plotted with the blue line on the left axis and the S&P 500 is plotted with the red line on the right axis. Vertical reference lines have been added to highlight important turning points for each indicator. First, how is the consumer staples sector, the epitome of stability, performing relative to the overall market? An underperforming consumer staples sector is typically evidence of improving risk appetite, stable to rising interest rates and improving consumer confidence. Alternatively, outperformance of the sector can be an indication that market participants are sniffing out weakness in the economy. Usually, the consumer staples sector starts to outperform the broad market ahead of significant downturns in stocks, as the vertical lines below demonstrate. 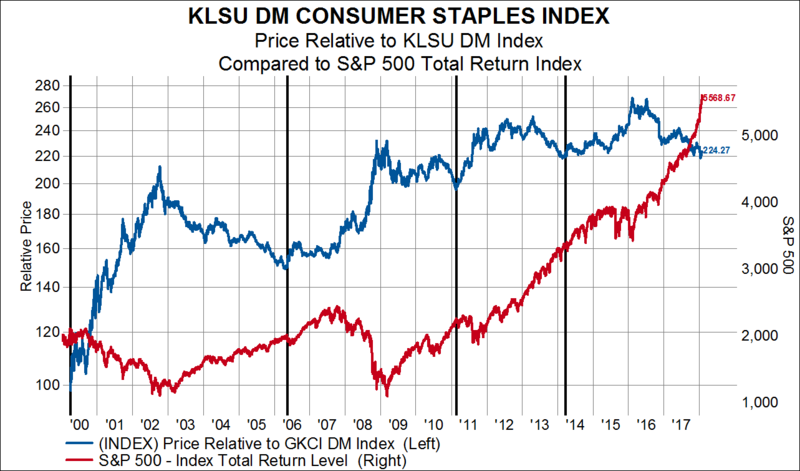 Currently, the consumer staples sector is in the throes of a multi-year period of underperformance, suggesting more strength, not weakness, is in store for the stock market. 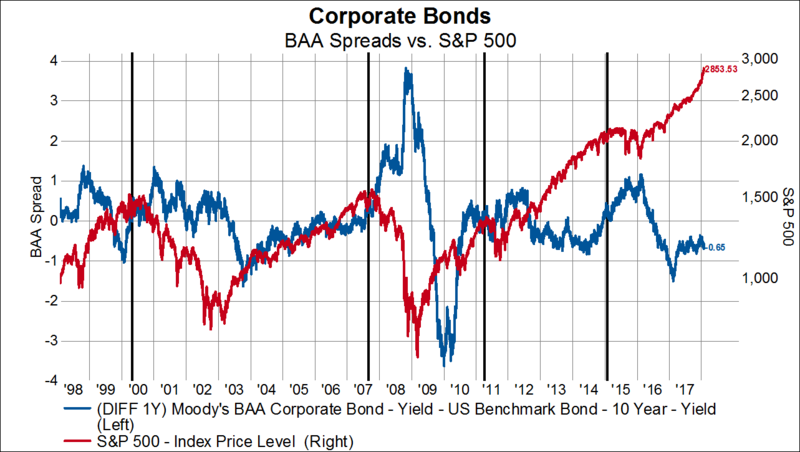 Second, are corporate bond spreads higher or lower compared to a year ago? The difference between yields on corporate bonds and yields on treasury bonds (the credit spread) is an indication of investor willingness to take on credit risk to achieve a higher rate of return in fixed income portfolios. If bond investors are increasingly confident about firms’ abilities to meet debt obligations then credit spreads will contract. Alternatively, credit spreads expand when bond investors become less confident about economic prospects. Typically, credit spreads start to rise on a year over year basis before important market peaks. Currently, credit spreads are 65bps lower than year ago levels, and are stable. Third, has the price of oil made a parabolic move higher? Oil, being an important raw material input into consumer products far and wide can have a dramatic impact on ex-oil consumer spending because demand for oil products tends to be inelastic. For example, the price of gas doesn’t necessarily dictate individuals’ demand for gas because it is a necessity. Therefore, price spikes in oil act as a tax on consumers and price declines act as a windfall. The last three huge spikes in the price of oil (other than the one that occurred in 2017) coincided with or led important tops in stocks. 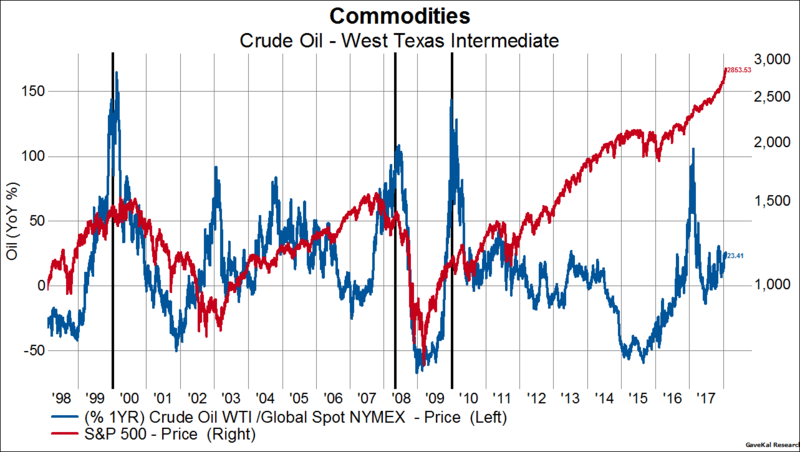 We aren’t yet close to a parabolic type spike in the price of oil. Finally, a good gauge of excessive investor sentiment, and therefore higher than normal market risk, is the year-over-year performance of emerging market stocks. When EM stocks are up more than 50% on a year-over-year basis it suggests investors have submitted to a fully risk-on, pedal to the metal mentality. 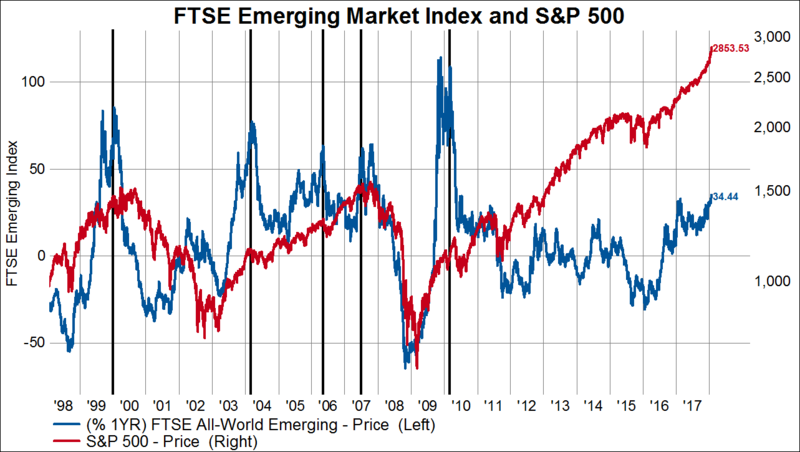 Such euphoria is never sustained for long and so parabolic price spikes in EM stocks tend to lead market selloffs. EM stocks, while some of the best performers over the last year, haven’t quite reached fever pitch yet. The absence of positive confirmations from these data suggest that, while the risk of an intermediate correction may be higher than normal simply due to the lack of one in recent history, any such correction would be for buying, and not for getting more defensive.